First, Kim Aldus will be teaching a women’s self-defense class on March 1 in Morton, Illinois. I know of at least one other person teaching women’s self-defense in this area, and let me tell you: Kim Aldus is hands-down the best. Also, I’ll be teaching a yoga seminar at the USA Martial Arts Hall of Fame in Indianapolis in April. 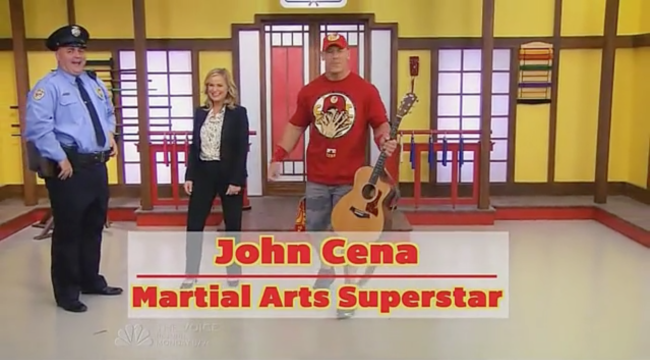 John Cena was arrested on an episode of Parks & Recreation this week for stealing Johnny Karate’s guitar … I guess? I’ve never seen a full episode of Parks and Rec, so I can’t provide you with any insightful context about this clip. All I know is wrestling and martial arts have briefly come together and I get to share that combination in this column. Oh, happy day. Manny Pacquiao vs. Floyd “Money” Mayweather is officially on. I’ve honestly never watched these guys fight, but I know they’re two of the best fighters on the planet, so I’d probably find a way to see this match. I’m only slightly familiar with Mayweather, and that’s when he fired off a couple shots into Big Show’s face in 2008. A 3-year-old recites her school’s creed in this week’s viral martial arts video. A friend sent this to me on Thursday night, and it has since racked up more than 2 million views. I have mixed reactions. On the one hand, I think it’s good that this kid (and others like her) are able to perform this way. On the other hand, this is basically cheerleading. It represents blind obedience to choreography, which I guess you could argue is martial arts anyway. I’m torn. “Situational awareness” is a term we martial arts folks hear about quite often. But you might be asking yourself what it entails. The Art of Manliness has a primer on How to Develop The Situational Awareness Of Jason Bourne. It’s a long read, but it provides lots of practical information. Situational awareness is a mindset that you have to purposefully cultivate. You want to get to the point that it’s just something you do without having to think about it. To get to that point, you have to practice it regularly. Here’s a collection of Street Fighter moves as performed in the UFC. I don’t even want to post any GIFs here for fear it might make you not click that link. Of note here: Dudes getting slammed on their hands, and one-handed shoulder throws. Fightland has really shot up the ranks of my favorite martial arts blog to follow. Also, I’ve never played Street Fighter. True story. Have you logged a martial arts workout with a fitness tracker? I just got the Fitbit ChargeHR this week, so I was both happy and disappointed in this StackExchange topic – I thought it would have more answers, but so far contains mostly conjecture and generalisms. Of all three workouts I did this week with it on, though, my heart rate was highest when I was doing martial arts over DDPYoga. Crime is up in Peoria. That’s according to data from the Peoria Police Department. My analysis, however, showed that overall, crime is down in the city over the past 15 years. Significantly. My plea is for martial arts instructors to stop throwing out the “crime is going up all the time” phrase when they’re talking about self-defense.